Bright fabrics pop! These tough totes are fully lined with canvas or twill and feature large interior pockets. Exterior fabrics are interfaced for body, strength, and durability. Gusseted bottom so tote sits flat, expands wide. Webbing handles triple stitched at stress points. Totes are machine washable and dryable. Light iron if needed. Our extra large yoga mat bag fits an extra thick mat (mine is 24" x 4-1/2" in diameter) and will accommodate accessories like eye pillows, water bottles, towels, straps, and even blocks. A large pocket will hold class card, ID, and other bits and pieces. On-board key fob will keep your keys in easy reach. Top features drawstring closure with toggle. All stress points are reinforced. Created from durable cotton canvas with webbing carry strap. Yoga mat bags are machine washable and dryable. Light iron if needed. The Zippy Pouch is a tapered zippered pouch that sits flat with a gusseted bottom. The Super Pouch is a flat zippered pouch with approximate dimensions of 8” long by 5” tall. The Tiny Pouch is a flat zippered pouch with approximate dimensions of 5” long x 4” tall. 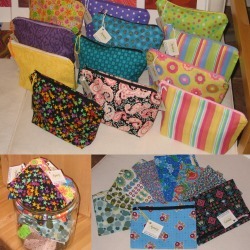 All pouches are made with 100% cotton fabric, fully lined and machine washable. This wristlet features padding to protect your iPod, smart phone, or camera. A front pocket is perfect to hold earbuds or cash and a few cards so you can travel light!